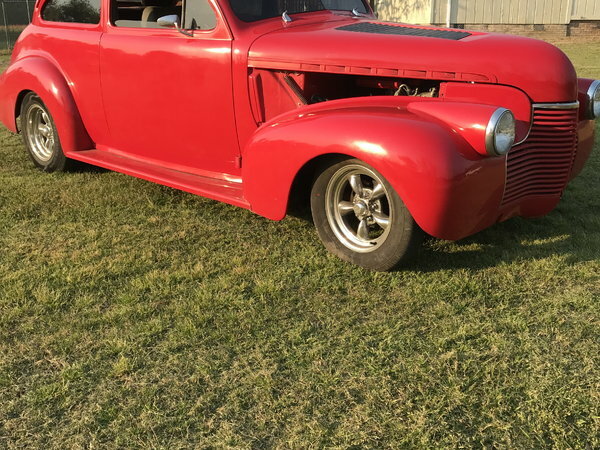 Up for sale is a 1940 Chevrolet Master Deluxe Sedan. The car has many body modification which included a 4" chopped top, shaved door handles and locks, smoothed firewall, recessed louvered hood vents, recessed tag, frenched tail lights, trunk hinges moved to the inside, and custom built dash. The car has a manual mustang rack and pinon steering installed with disc brakes on the front. The rearend is a 8" ford with chevy 4.75" bolt pattern. It has new American Racing torq thrust wheels (8" on the rear and 6" on the front) and new tires. The interior has tilt steering, VDO gauges, vintage A/C, electric 3 speed wipers, power windows, and later model bucket seats. The running gear is a 350 engine with a 350 transmission. It has a Griffin alum. radiator with built on fan shroud and stainless steel gas tank. The car drives and handles well. Car is sold with Bill of Sale. Price is not negotiable. I do not text.